Designed to help users complete tasks quickly and efficiently, the imageCLASS MF810Cdn's advanced capabilities deliver impressive, customizable usability while also saving space. The MF810Cdn is a new model to the imageCLASS line up. It adds a 3.5" Colour touch panel with adjustable angles. 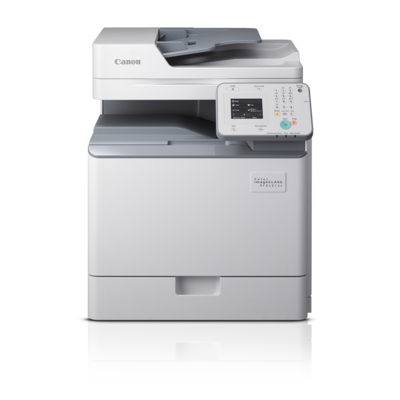 The MF810Cdn combines all print, copy, scan and fax needs for small and medium business users. This machine has several different hardware and software configurations to fit the specific needs of its users. Print and scan on the go from your laptop, tablet, or smartphone in a flash with any of Canon's mobile print solutions, including Apple AirPrint and Mopria Print Service for Android users. The imageCLASS MF810Cdn model incorporates innovative, eco - conscious solutions that help keep your business operating efficiently while helping to reduce your environmental footprint. 1 Mobile printing capabilities will require MF800 Series product to be attached to a wireless router. Wireless printing requires a working Ethernet network with wireless 802.11b/g or n capability. Wireless performance may vary based on terrain and distance between printer and wireless network clients. 2 AirPrint functionality requires an iPad, iPad Mini, iPad 2, the new iPad, iPhone 3GS or later, or iPod touch 3rd generation or later device running iOS 4.2 or later, and an AirPrint-enabled printer connected to the same network as your iOS device. A printer connected to the USB port of your Mac, PC, AirPort Base Station, or Time Capsule is not supported. 3 Mopria Print Service, available free in the Google Play store, requires a compatible Android KitKat 4.4 smartphone or tablet. The printer must be either wirelessly connected to the network router or with an Ethernet cable. The mobile device and printer must be connected to the same network. 4 Print speeds are based on internal testing. Print and copy speeds may vary depending on the number of copies selected, as well as on the settings for size, type, and orientation of paper. 5 Based on 20 lb. Bond Paper. 6 Scanning with MF800 Series requires TWAIN compliant software scan utility. 7 May vary depending on the output environment. 8 Letter-sized, after being restored from Energy Saver mode. 9 The Public Switched Telephone Network currently supports fax modem speeds of 28.8 Kbps or lower, depending on telephone line conditions. Sending and receiving fax machines need to conform to ITU-T v.34 guidelines. 10 Based on ITU-T #1 Chart (Standard mode). 11 Based on 20 lb. Bond Paper. 12 Requires Canon Mobile Scanning for Business app, available free on the App Store and Google Play; compatible with iPhone 5S, iPhone 5C, iPhone 5, iPhone 4S, iPhone 4, iPad Air, iPad 4, iPad 3, iPad 2, Original iPad, iPad mini, and iPad mini Retina running OS 5.1 - 7.1. Supports Android Tablets and Phones running OS 4.0 - 4.4.213. 13 Warranty program is subject to certain conditions and restrictions. See the warranty card for details.